No problem. You have my permission. Hello. Is there a quiz online that I can give to my son on this book? I’m working on comprehension with him. What are three big ideas for this book? My son Jayce loves this book series! Will there be another book after Above? I’m afraid not, but I do have 25 other novels that I think he will like. Please say hello to Jayce for me. Our middle school in Lincoln NE has a 6th grade class that is reading “Beneath” right now as a reading group and they LOVE this book. We plan on getting copies of “Above” for our media center so that they can continue reading. Great book ! Thanks Mr. Smith!! Just finished Beneath and I loved it! I always push your books throughout the school year and try to get more kids hooked on your books. 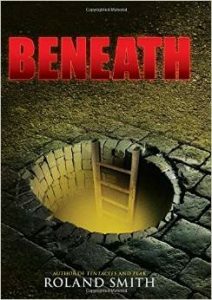 Beneath sounds a little bit like Zack’s Lie where they need to hide. I cannot wait to go to Barnes & Noble and buy the sequel today! I have not read one of your books where they do not grab you and hold you until the end and then you wish it never ended! Loved the way the chapters started. Great way for kids, and me, to keep reading. I hope you are enjoying your summer! I am hoping I can get you on a video conference this fall, maybe after the book tour ends in October. Best to you and Marie and hope all is well with your family! Marilyn Laird, librarian Northwest R-1 School District, House Springs, MO (The same one Kim H. works at!) P. S. Just read some posts and found out that Above will be out in Sept. Bummer! Wish it was now! Thanks for a great story. Hi Marilyn. I’m so glad you liked BEANEATH. I hope you like ABOVE just as well. We are going to be out on a school tour September and October in your neck of the woods. Maybe we’ll see you. If you are interested in a visit contact Marie at marie@rolandsmith.com. Say hello to Kim for me. You are welcome Sara. I’m glad you liked it! I’ll be out your way in the Fall on a school visit tour. If you are any other schools are interested email my wife Marie marie@rolandsmith.com. I love this book please message me back I love your creativity and thought in the book beneath. I am 11 years old and the second I got this book I was intrigued PLEASE message me back! I’m glad to hear you liked BENEATH. I hope you get a chance to read the sequel ABOVE. This seems like a really interesting and detailed book. I would buy this any day. I am really into graphic novels but this just pulled me in to it. Glad to hear this. I hope you get a chance to read the sequel ABOVE. I recently read Beneath and Above and loved them! I was just wondering if you knew Terry Trueman, author of Stuck in Neutral. I recently read Resistance by Jennifer A. Nielsen. I looked on the back and found a quote by him. I was just wondering if you purposely named the homeless banker after him.